With admirers ranging from the Clintons, Warren Buffett, Maya Angelou, and Dianne Feinstein, Glide Memorial Methodist Church in San Francisco has been inspiring, infuriating, welcoming, and changing the world for fifty years. Now in Beyond the Possible, the two founders, Reverend Cecil Williams and Janice Mirikitani, show how Glide transformed a dwindling all-white congregation into a diverse and energetic community of the poor, the disenfranchised, the homeless, the addicted, the mentally ill, the newly immigrated, and the politically passionate. A vivid storyteller, Cecil describes removing the trappings of conventional religion to make way for a new spirituality—one that embraces gay rights, jazz in the sanctuary, the antiwar movement, and Celebrations that fill the church to this day. In prose as gripping as her acclaimed poetry, Janice recalls starting out at Glide as a nonbeliever in the 1960s who found herself drawn to Cecil’s vision for social justice. 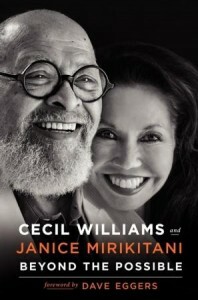 Soon we see how Cecil’s charismatic power, combined with Janice’s organizing genius, created a model for wraparound health care, a million free meals for the hungry each year, apartments for the homeless, and a stand-up pride that confronted police brutality, riots, racism, and institutional bigotry. And we discover that Glide’s insistence on inviting rather than avoiding controversy has revolutionized approaches to drug addiction, racial conflict, and domestic violence. Both a personal love story and a riveting view of American history, Beyond the Possible demonstrates what is truly possible for all of us. Here is Obamacare with a human face. Here is Martin Luther King Jr.’s vision of “the beloved community” come to life at last. And here is a courageous couple facing impossible odds—and discovering the power of unconditional love time and time again. For more than fifty years, the Reverend Cecil Williams has been recognized as a national leader on the forefront of change in the struggle for civil and human rights. Janice Mirikitani is the founding president of the Glide Foundation and was San Francisco’s second poet laureate. Cecil and Janice have been married for thirty-one years.